It started out 8 inches in diameter, and at least 10 inches tall. 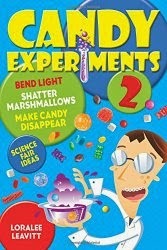 Here at candyexperiments.com, there's only one thing to do with something that big. Smash it! I smashed and squished my cotton candy together, squashing it and rolling it between my palms until it got as round and hard as a giant jawbreaker, about 2 inches in diameter. Not only did it get smaller, it turned hard. Listen to the sound it makes when it drops. It's a giant cotton candy marble! Notice the color? While the original cotton candy was almost white, squashing the fibers together concentrated the color, making the final product a beautiful robin's egg blue.